← What Are You Being Prepared For? We had already argued our case in written form as well as in person during various team meetings. They had seen our vulnerability, our parent angst, a few tears, our pain, our fear, and our determination. They knew our passion. We had shared openly our prescription battles and medicine failures. We had opened our palms face up showing all our cards, revealing our plans for further outside evaluations and our current count of five outside specialists. I resolved to be open, shed light, break down any misunderstandings about anxiety and depression, educate, and tear down the stigma. To be fair, I believe everyone in the room was as open about mental health as I am, but when it comes to what goes down on paper to help a child’s academics, that can be the elephant in the room, and sometimes, we can all smell that elephant, but it’s hard to acknowledge he actually took a place at the table with us. Two depression episodes later. Two years of the same pattern: lost functioning for two months. Two rises in anxiety and shut-downs of an otherwise socially and academically bright child. ADHD can explain some of it, sure, but anxiety was the monster behind the rest. Would they see it that way? If they don’t see it consistently negatively impacting academics, would they take the mental health piece seriously? We listened. We tried to repeat back their words to make sure we comprehended the overall message, goal, theme, understanding, vision. We heard the abridged explanation of so many psychological, educational, and occupational therapy evaluations and the thrown-out acronyms and statistics of where he fell in the range of normalcy and average, whatever they really are in Educational Jargonville. Yeah, those are the ones that make me want to go hide under the bed with Smell-ephant, his sensory elephant, and never come back out. I frankly prefer the more benign ones like sensory diet, quiet workspace, and that absolutely glorious word: accommodations. After asking some questions and expressing some concerns, we were painstakingly walked through a flowchart, the purpose of which was to determine eligibility for services. And then there it was: He had two disabilities—not just one. Untreated, they both affect academics. I’m so thankful they didn’t try to separate out or tease those related diagnoses apart. Yes, anxiety and ADHD are two different animals, but they make their bed in the same room, and they usually lie down wrapped around each other. Same thing with sensory integration issues: It’s sometimes pointless to sort out which came first—the chicken or the egg—because if you seek sensory feedback more than the average person, not receiving it can make you anxious and inattentive. If you are anxious and inattentive under stress or because ADHD is not well managed that day, you seek more sensory feedback to ease your stress level. As the eight specialists, teachers, guidance counselor, and administrators (remember they are simultaneously Lovers of Educating Children and Defenders of the Holy Budget—an understandably tense combo some days) surrounded us delivering news that not only would we get a revised IEP (and not be thrown off the ship), but we were now to receive 45 minutes of pullout services going into his new school year, I felt like God had set this table for us. I’ve never been so happy in my life to have my kid listed with two disabilities and get 45 minutes pulled out for service a week. Pushing back the stigma about anxiety/depression one child at a time. Thank you all for your prayers! I’m so grateful. It was more than we had let our hearts hope for! Before this day, we had spent a lot of time building our case in team meetings, reading special ed law, and typing up our reasoning/justification/advocacy. I will not stop advancing this cause just because we have a win, but I’m so grateful we can relax about next school year a tiny bit. Thank you all for your amazing support!!!! Thank you, God! You are holding Little Man’s hand right now, aren’t You? I can almost see it, but it amazes me that You are simultaneously holding mine. *Salad Boy’s and my research, preparation, outside-evaluation-collecting, and advocacy for Little Man could only get us so far. We knew the risks of where Little Man fell on the budget-justifying spectrum. We knew the law. We knew where the district could dance around the law and where we could insist on certain rights. We understood both sides of it and respected those evaluating our son—both inside and outside the school. But I’m convinced what made a difference in this was laying it at the feet of our amazing Savior. It was trusting Him, asking Him to lead us, telling Him to help us choose and measure our words carefully, and seeking His assistance in building our relationships with people in positions of help that made the difference. I believe He blesses those who work with pure hearts to help our kids when we ask Him to—and I do ask Him, somewhat frequently. I want to say here that the outcome could have gone either way. For other IEP-advocating parents—those who pray and those who don’t—we sometimes get a win and sometimes have a bigger battle ahead. The table He prepared for us was a path we could trust for our son—whichever path that turned out to be. Not everything has gone our way. Not every time have we been understood. But we know that because we asked Him, He has our child’s future in mind. He has our back. Had we not received services, we knew He’d show us a different way. If it wasn’t what we wanted, we knew it would be what we needed—for personal growth, for increasing faith, for Little Man’s overall future. We pray every day. I bless Little Man with the peace of Christ every day. I speak a blessing of who he is in the Father’s eyes, not what is said on a piece of paper. In the Father’s eyes, he is exactly who he should be right now and one day will be whole and healed. In the meantime, I see God working new things in us through this trial, slowing us down, bringing more peace in the storms. And I see a table laid before me that isn’t in a sterile elementary school conference room with 10 tense people sitting around it hoping they find the meeting of the minds. That’s where my faith, trust, and hope lie, no matter which results swirl around my IEP table, in upright cushioned chairs in the specialist’s office, or even on the weighted-with-much-angst days around my own kitchen table. 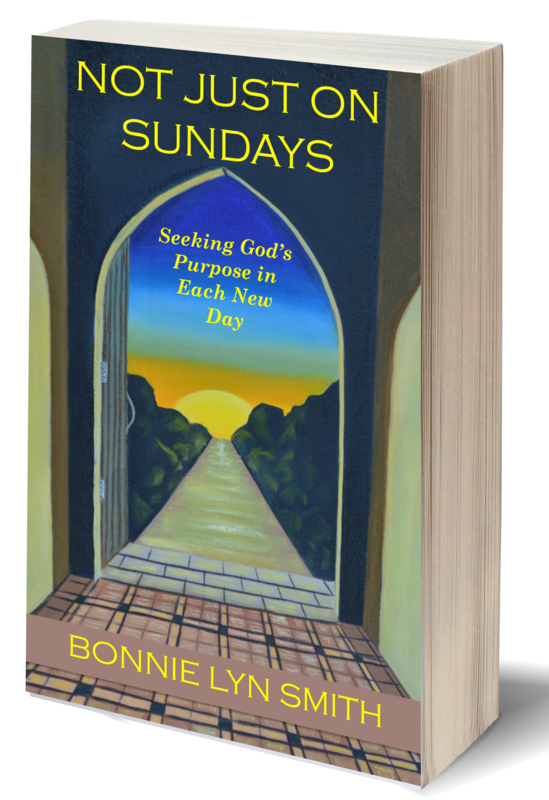 More on our personal struggles with ADHD/OCD/anxiety/depression and our journey to greater wholeness can be found inside Not Just on Sundays: Seeking God’s Purpose in Each New Day. **This blog has been shared at Mom 2 Mom Monday Link-Up, Make a Difference Mondays, Grace & Truth, Simply Inspired Wednesday’s Link-Up, Christian Mommy Blogger, RaRa Link-Up, Blessing Counters, A Little R&R Wednesdays, Faith-Filled Fridays, Dance With Jesus, Sunday Thoughts Link-Up, and Saturday Soirée Blog Party. You speak about you son’s challenges with such courage, intelligence and eloquence. Thank God for prayer, that lifeline by which we pray with, in and through Jesus Christ, our Savior. I am so glad that your family’s prayers were answered in this ordeal. Yes, God sets the table for each of us, calling us to partake of his grace and fortification. Hillary: Thank you so much. I draw so much encouragement from your words. They are very ministering. Thank you for coming by “Espressos of Faith.” Blessings to you! It is nice to see you so open and honest about your struggles. Those are the kind of words that can help others in the same situation. Thank you, kcgroves. I feel encouraged by your comments. I debated how open to be about these issues. Wow…wow..wow..wow…you just took me back 14 years. I know how hard it is to sit at that table. I know how hard it is to hear about your child from others. I was there. I really still am there..my child is not 18 though. I loved the Bible verses you used. Having faith is what got me through thise years. I remember a time when I just couldn’t accept that my son had something wrong. It was such a struggle. Then one Sunday I actally took my son up to the altar at church..sat him on the step..bowed my head and cried and prayed. I told God I would accept my son how he gave him to me. It was such a freeing moment. God lifted a burden off my shoulders and I saw my son as I should. I am not going to say it has always been easy from then on…but I can say it has been a joy. God gave me the most beautiful son..I love him so much. Tammy, thanks so much for reading this. I really appreciate you sharing your story with me. It really encourages me to hear from someone who has walked this path. All of my vulnerability feels spread out over some kind of public altar when it comes to having to advocate for my son, but there is so much peace in knowing God has a plan. Blessings! I am grateful for your kind message. Thank you. What a very raw and rewarding post, Bonnie. I work in Pastoral Counseling and know how hard it is for parents to get proper feedback and understanding of what their child is suffering. I’ve added your post and book to my Resource list for parents. Thanks so much for being “real” about your struggles and what you’re learning through the journey. Susan, that is so very kind of you to share the book and post. I really appreciate it. More than anything, I want others walking through this kind of thing to feel less alone. I am trying to start up a focus group at my church for parents of special ed kids and kids with disabilities and/or mental illness. Waiting on God to finish prepping me. This is a great resource: https://drgrcevich.wordpress.com Bless you, and thank you for your comments! That’s wonderful, Susan! So great to hear that! I love hearing that more and more churches are doing this. Blessings on your weekend. Gina….I carry a special place in my heart for you as I visit your site as well because while the exact struggles differ, what we carry around is too heavy to carry alone. Only our Savior can fully lift those for us. Thank you so much for your incredible encouragement. I read it several times today, coming out of a sensory meeting, actually. I agree with you that whatever God chooses to do (or not do) ultimately doesn’t matter. It’s seeing Him holding the hand of our children and ours as well. Blessings, and thanks so much for coming by “Espressos of Faith”! Remember when I went through that with my oldest son. Because he tested above the average student at the school, which was 60% and under, they couldn’t help him. They just gave me a list of things to help him with his learning disabilities. Most of which I was already doing. Have you read Disconnected Kids? That help a lot. Changing his diet and getting off grains and sugar helped too. Oh, Bonnie…thank you for letting me know about that book. I will look for it at the library. Blessings! I always appreciate others sharing what they’ve learned and what has helped. So glad to be connected with you! Wow! As a regular ed teacher, I’ve been on the other side of these meetings. Usually, I expect the parents to come in simply not understanding what we are doing at school for their child. These meetings even frustrate me because I don’t really understand everything that the special education teacher is talking about. (Educational Jargonville is a huge place, and I wonder if I’ll ever manage to explore all of it.) I actually tend to feel left out of these meetings, because my job is, essentially, to treat these students just like every other student in the room. Yes, I’m supposed to differentiate for special needs, and I do, but differentiation in the regular ed classroom includes every student, not just the students with IEPs. So, I say all of this to let you know how incredibly refreshing it is to hear about your family’s vast investment in just one IEP meeting. 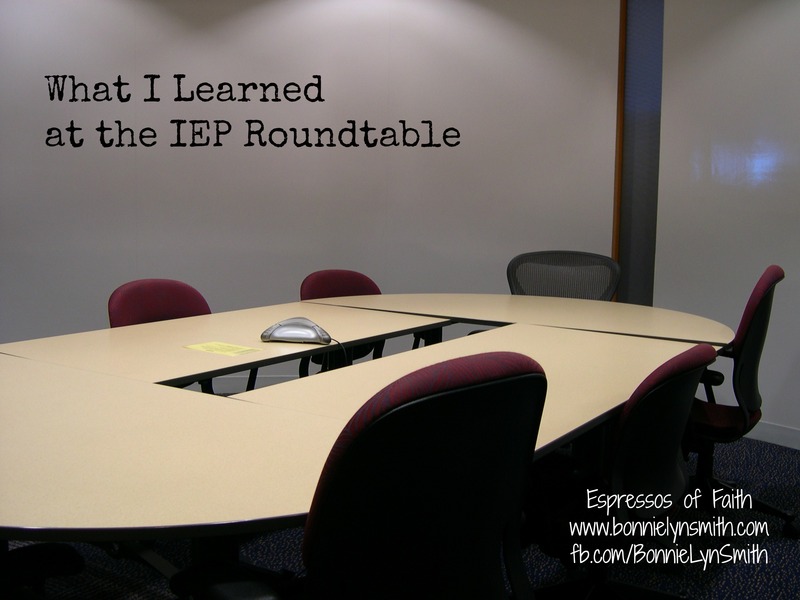 I meet a lot of parents who think IEP meetings are a waste of their time or simply believe that the IEP doesn’t actually care about their child. Reading your point of view has helped me adjust my point of view, and I thank you for that. Elizabeth: Thank you so much for writing these thoughts out for me. It’s also very good for me to know the other “side” (for lack of a better term). I am glad to read your perspective. We prepared for this meeting for almost a year. We wanted the school to know we, as parents, were doing everything possible outside the school but also that we appreciated so much what they were doing. We all were in amazing agreement, I think because we came in with some research done to understand a little bit better. It’s always good to find what were all working toward together and go from that point instead of assuming we are in different places, but at the same time, it can be very intimidating for parents, even with lovely people around the table representing the district. Thanks so much! I read what you wrote several times!